Felix Stoffel, Swiss communication analyst and artist, developed Structuristic Art more than 30 years ago. Following Joseph Beuy’s (1921-1986) famous quote ‘Everyone is an artist’, Stoffel wanted to turn the theoretical framework of this famous German installation artist into practice. To the present day, there have been over 2’500 registered Structuristic artworks made by around 600 Structurists from over 20 nations. Some of these works of art, painted by a group of Swiss artists, will be presented at the Art Exhibition in Lūznava. 22. August 2018 Cordial invitation to the exhibition opening! 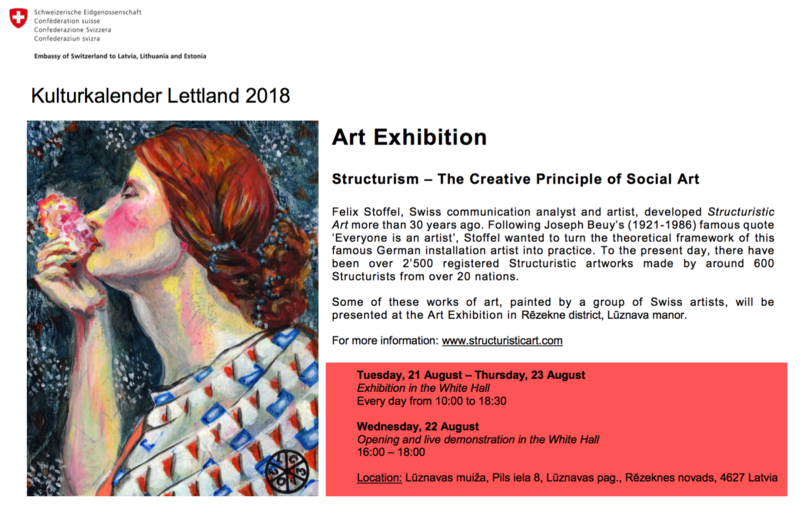 The opening as well as the live demonstration takes place in the White Hall on Wednesday, 22 August 2018 between 4:00pm and 6:00pm. The exhibition taking place in the White Hall from 21st to 23rd of August 2018 is open for visitors between 10:00am and 6:30pm. Felix Stoffel, Swiss communication analyst and himself artist, deveoloped Structuristic Art more than 30 years ago. Following Joseph Beuys’ (1921-1986) famous quote ‘Everyone is an artist’, Stoffel wanted to turn the theoretical framework of the renowned German installation artist and art theorist into practice. The highly pedagogical and universal concept soon proved that the claim could read “Everyone is a Structuristic artist”. Joseph Beuys, on the other hand, was inspired by the poet Novalis (1772-1801), and was convinced that everyone is gifted with an intrinsic creative force. Beuys coined the term ‘Social Sculpture’ to point out that art is socially widely accepted. Felix Stoffel’s philosophical concept called ‘Structurism’ was also meant to provide practical evidence of the social aspect of art. He was unmistakably successful: To the present day, there have been over 2,500 registered Structuristic artworks made by around 600 Structurists from over 20 nations. Dr Pāvels Narica leads the international education centre in Rēzekne in memory of his grandfather, the author Mihails Narica (1909-1993; see www.narica.ambrand.lv). The latter was keen to support artistically gifted children and youth. 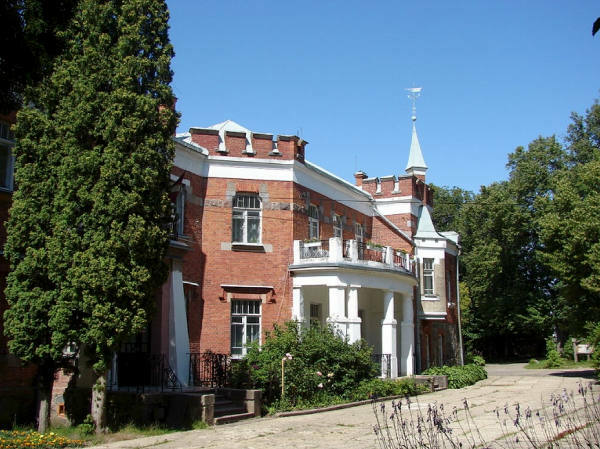 In that context, Pāvels Narica contacted the artistic head of Structuristic Art Centre, Laila Capadrutt, in 2008 (coincidentally, she named her former art school ‘Narica’). 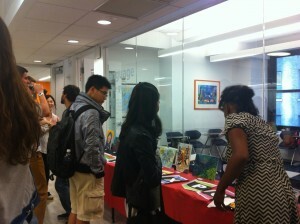 His approach marked the beginning of an up to this day animated international exchange with several projects involved. Children and youth from the tri-border region Germany, Austria and Switzerland, took part with their Structuristic artworks in several competitions organised by the international education centre of Mihails Narica. On the other hand, children and teenagers from Latvia were invited to the mentioned border triangle to join Structuristic Art workshops and excursions. Pāvels Narica has been holding a deep desire to organise a Structuristic Art exhibition in Rēzekne for quite some time. Thanks to the good relationship to the head of Lūznavas muiža centre, Miss Iveta Balčūne, his wish will be fulfilled this summer. 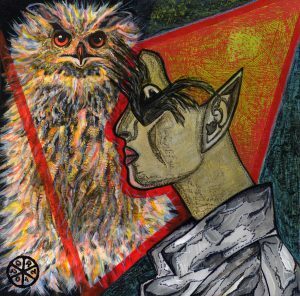 Structuristic Art is culturally speaking social because it represents a down-to-earth craftsmanship that consolidates not only artistic, pedagogical but also psychological aspects. The method is for people of all ages who find joy in creativity and who, at the same time, want to take part in a continually growing artistic organism. Felix Stoffel established a technique where several layers of colour are interwoven. The method is easy to learn and therefore immediately creates a sense of achievement in every pupil. Another distinction shows itself in the collective label, which presents the Structuristic Art method publicly and also gives the ability of a unifying registration. The latter has the form of an individually coded stamp which only demonstrably Structuristically made artworks are granted. Structurists, who – naturally voluntarily – register their artworks, identify themselves not only with their own masterpiece, but also with the overall cosmos of registered artworks of all official Structuristic artists. 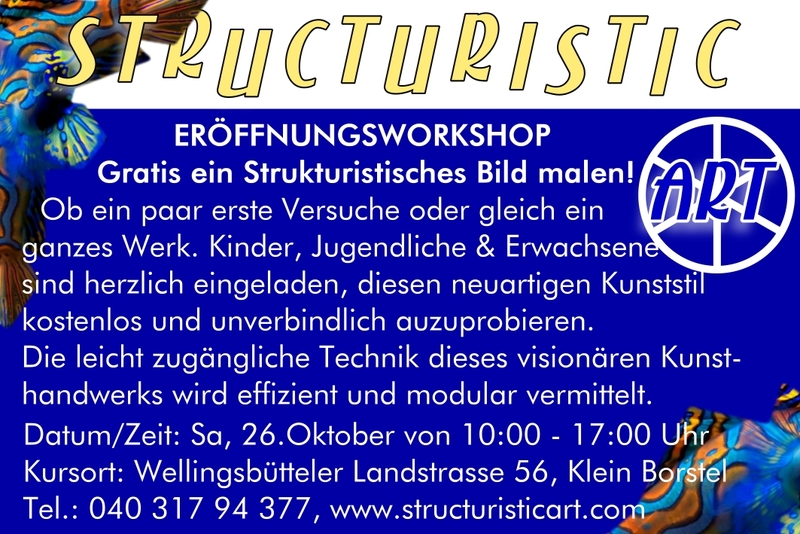 Everyone interested in Structuristic Art has the opportunity to take part in hobby workshops. 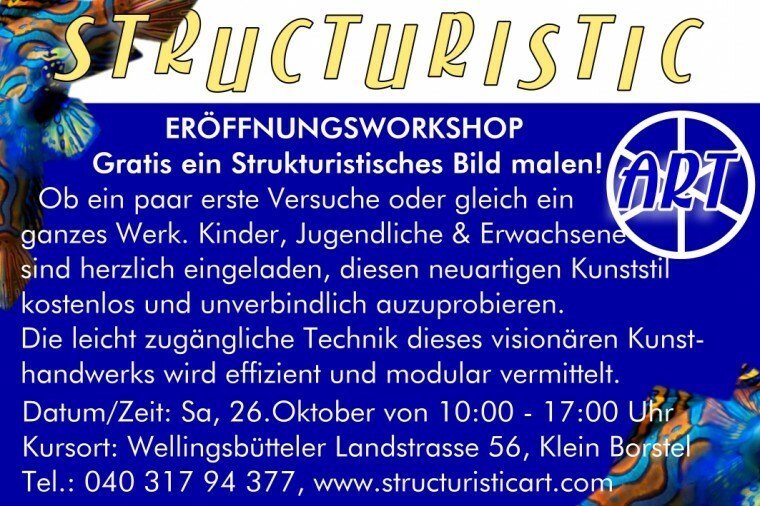 If you want to take a step further, you are more than welcome to be educated to be a professional Structuristic artist. In order to do so, one needs to complete four modules (each contains 60 one-hour long lessons) as well as several final examinations, which are signalised with a diploma each. The technical content is taught in the fashion of an easy to learn craftsmanship. We also offer Structuristic Art webinars nowadays! Wherever you are, with our new online education concept you are able to create unique Structuristic artworks with us! 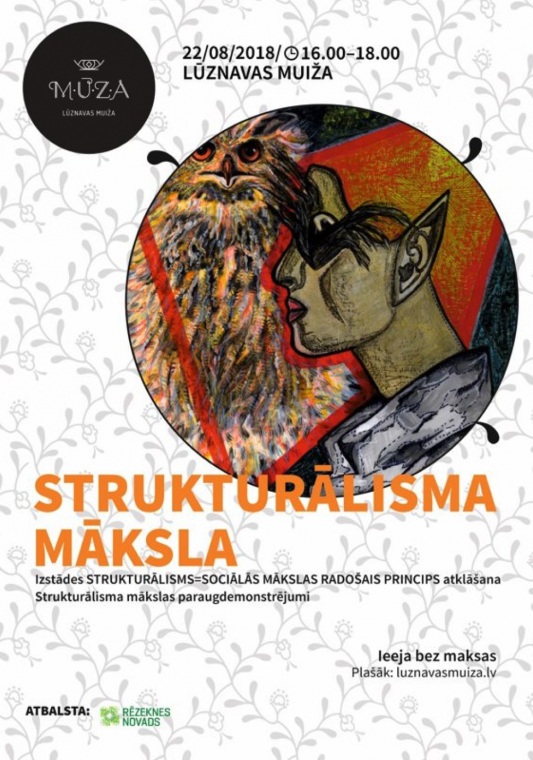 We are looking forward to welcoming you to the Structuristic Art opening and exhibition! Posted in Events @en	| Comments Off on 22. August 2018 Cordial invitation to the exhibition opening! Wir gratulieren unserer jüngsten fertig ausgebildeten Malschullehrerin, Teodora Bondar aus Lindau, zu Ihrem hart verdienten Ausbildungsabschluss! Es bedeutet schon etwas, wie diese junge Frau, neben ihrem Abitur, ihr Ziel mit viel Fleiss verfolgte und die nötigen Kurse sogar in Hamburg regelmässig besuchte. An Ihrem Prüfungstag wurde der gesamte Stoff der vergangenen Jahre abgefragt. Ein langer Tag voller Konzentration auf anstrengende Herausforderungen. Aber es hat sich gelohnt. 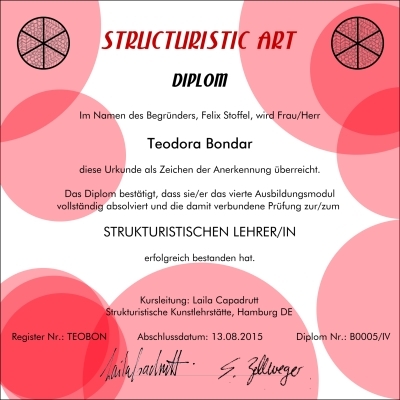 Mit Bravour hat Teodora Bondar im Alter von 18 Jahren das Diplom zur Strukturistischen Lehrerin am 14.08.2015 in Hamburg erhalten. Das gesamte Strukturistische Leiter/innen-Team gratulierte ihr beim anschliessend Abendessen feierlich zu diesem grossartigen Erfolg. Wer sich erst einmal ein Bild über das Strukturistische Kunsthandwerk machen möchte, ohne gleich zu Pinsel und Farbe zu greifen, kann die Strukturistische Bilderausstellung besuchen: Am Sonntag, dem 15. Dezember, von 14 bis 17 Uhr an der Wellingsbütteler Landstraße 56, 2337 Hamburg. Vielleicht findet sich unter den Originalen ja sogar das ideale Weihnachtsgeschenk. 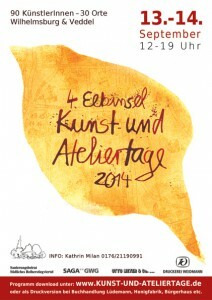 Neuartiges Kunsthandwerk für jedes Alter, vorzugsweise mit Anmeldung: 040-31794377. Selbst in New York sind jüngst Strukturistische Werke unter der Leitung von Onna Rageth aus Domat/Ems (Schweiz) entstanden. Ihre sprachliche Weiterbildung während der Semesterferien nutzte sie unter anderem dazu, das Strukturistische Kunsthandwerk mitten in dieser Weltmetropole zu vermitteln. Dies gelang ihr mit grossem Erfolg. Nicht nur Studenten aus Europa, Südamerika und Asien hatten mit Elan und Freude mitgewirkt, sondern auch eine ihrer Englisch-Lehrerinnen. Dank deren Engagement wurden die in New York entstandenen Bilder in der EC-Language-School ausgestellt.